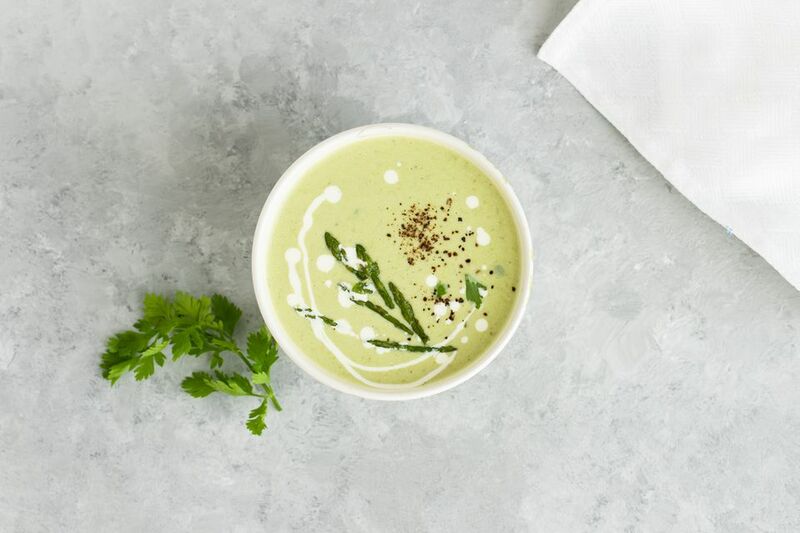 This creamy asparagus soup is a great way to start a springtime dinner. The soup is a simple combination of asparagus and a creamy white sauce. The thickened base for the soup is made with chicken broth, and then heavy cream is added just before serving. If asparagus isn't in season, feel free to use frozen asparagus spears. Top this soup off with a few cooked asparagus tips, a swirl of sour cream, croutons, or some bacon crumbles. In a medium saucepan, cook leek or onions in butter over medium-low heat until tender. Add flour and stir until well incorporated. Cook, stirring, for 1 minute. Add the chopped asparagus and the 2 tablespoons of fresh chopped parsley to the saucepan and bring to a boil, stirring constantly. Reduce heat to low, cover, and simmer for about 15 minutes, or until asparagus is tender. Set aside a few cooked asparagus tips for garnish if desired. Carefully, working with about 2 cups at a time, blend or process until smooth. Return to the saucepan and add cream. Add a dash of pepper and 1/2 to 1 teaspoon salt, or to taste, and heat through. When blending the soup, please be aware that the steam and heat can blow the top off of a blender if it's filled too full. Fill the blender about one-third full or no more than half. Place a folded kitchen towel over the lid and hold it firmly when you begin to blend.